My gallery - 40A Waverley Street, Richmond, Nelson Bays. Original paintings and craft works, books, cards, prints. Private and multi student tuition available for Bird and Botanical art in ink and wash, acrylic, watercolour and gouache. 30th March - 1st July 2018. Auckland Botanic Gardens, NZ. Awarded the Oceania News 2017 NZ Business Awards, Best NZ Wildlife Art Gallery. My Goldpoint drawing of the NZ Bush Robin is for sale at the NZ Academy of Fine Arts pre-Xmas Exhibition. 'A Spring in your step'. 3rd - 25th September at the NZAFA galleries, Queens Wharf, Wellington, NZ. Group exhibition featuring bird and botanical works. Supporting the Brook Waimarama Bird Sanctuary Nelson. In this addition of NZ Artist Magazine there is an article on my work. An exhibition of my bird paintings will be on display at COURT FLORIST, 143 Victoria Street, Christchurch Central, NZ. Next exhibition will be at the Eastern Southland Gallery, Gore, 19th June - 26th July. Joseph Maiden Theatre, Royal Botanic Garden, Sydney Australia. The exhibition runs from Saturday 18th April - Sunday 10th May. daily 10am - 4pm. An exhibition of 16 of my botanical paintings is currently on display at COURT FLORIST, 143 Victoria Street, Christchurch Central, NZ. Two of my black and white botanical works will be on display at the Millenium gallery in Blenheim from 25th October. They are part of an exhibition by the NZ Botanical Art Society of plants of the Canterbury Florilegium. The exhibition is on tour and will be at Timaru in December. I will be holding a Botanical Art Workshop at Shamar Gallery on Saturday 8th November 2014. The workshop is limited to 6 x people and will run from 10am - 4pm. Cost $80. Please email me at: janet@janetemarshall.co.nz or phone: 0275286049 for booking and/or information. My 2 x paintings Tui on Rata and Metamorphis have been accepted for the New Zealand Academy of Fine Arts latest exhibition Flora + Fauna + Floribunda. The exhibition is showing at the Academy galleries, 1 Queens Wharf, Wellington from 6th September - 1st October 2014. My painting 'METEMORPHIS' has been selected as a finalist in the Peters Doig Marlborough Art Award. The exhibition is at the Yealands Estate Marlborough Gallery, 204 High Street, Blenheim. Saturday 18th May - 15th June 2014. Opening presentation & awards Saturday 17th May, 6pm to 8pm. held at the Botanic Gardens, Sydney, Australia. Christchurch Botanic Gardens Pavilium,tbc. Dates to be comfirmed. I have 2 x black and white illustrations in this exhibition of NZ trees. Special weekend viewings in conjunction with the Botanica 2013 Exhibition 13 - 14 and 27 - 28th April, 10am - 4 pm. Where: Red Box Gallery, The Royal Botanic Garden, Mrs Macquaries Road, Sydney, Australia. My entry is of NZ Coprosma Robusta. NZ Botanical Art Society annual exhibition 'BOTANICA' to be held at the Canterbury Museum, Christchurch, 16th February - 3rd March 2013. I will be exhibiting 2 x botanical works - Kowhai and Phormium Colensoi (Flax). Second Life sim (Piece of digital land) for the online programme 'Second Life". an interactive programme on the internet. Sony Reader, Apple iPad and other eBook suppliers. Taniwha is a fantasy story set amongst the limestone caves and mountainous karst landscape of the northern South Island of New Zealand. 'Taniwha' is the Maori (New Zealand's native people's) name for 'dragon'. The story tells the adventures of 4 heroes bent on saving the countryside from the ravages of the Taniwha. 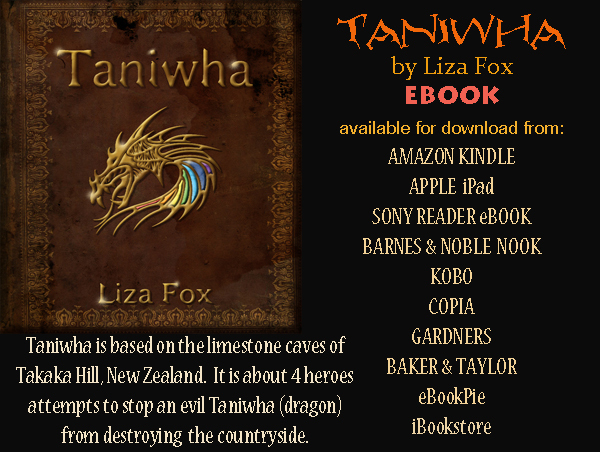 Set above ground amongst the marble rocks and native forest, and below ground in the limestone tunnels, caverns and caves, the domain of the Taniwha.The heroes are Toka, an ancient Maori man, Ben, newly arrived on the Mount, and his 2 neighbours, Sam and Sally. REVIEW ON AMAZON EBOOKS: 4.0 out of 5 stars Kiwi fantasy thriller, February 8, 2012 By Mrs. V. O. Blackwell "Veronica Bee" (Australia) This review is from: Taniwha (Kindle Edition) I enjoyed this book very much. It's a pacy, well-plotted fantasy story set in New Zealand, which gives it something of an off-beat tone. It's pitched at children, probably those 10 and older, and I think it will delight any child with some imagination. 2012 NZ Game Bird Habitat Stamp and Limited edition print featuring the Bobwhite Quail. NZ Post, NZ Fish and Game. Exhibition 'BIRD, BOTANICAL AND PORTRAIT PAINTINGS', MOMENTUM GALLERY at EQUILIBRIUM, including my WINGS OVER series. Church Street, Nelson. Throughout June. Peters Doig Art Awards 2009. The Marlborough Gallery, 204 High Street, Blenheim, 24th May-14th June. Open 10.30am to 4.30pm daily. Tutorial weekend for the Nelson Independant Art Group. Nelson 3-5th May. 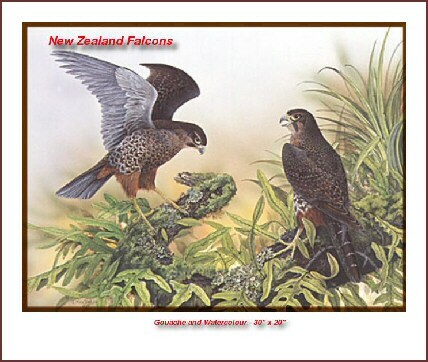 Tarapex 08 7-9th November - stamps and First Day Covers - Moa and Haast's Eagle. 2008 NZ Game Bird Habitat Stamp and Limited Edition Print. ART FOR CONSERVATION - charity auction. 26th-27th September 07 at the Michael Fowler Centre, WELLINGTON. I am now listed with the Artists in Schools Programme which is run by the Arts Alliance, who are contracted to the Ministry of Education to co-ordinate and provide curriculum support services in the visual arts for secondary school standards. This initiative seeks to enrich the teaching and learning in the visual arts in secondary schools nationally, by strengthening the links between the schools and the arts community. Campbell Island Flightless Brown Teal. 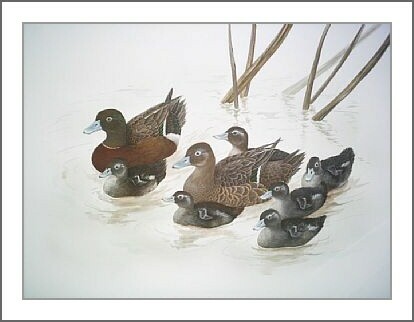 This painting has been donated to the Flightless Brown Teal Recovery Scheme, and was auctioned at an event on Pall Mall, London, on the 2nd September 2006. 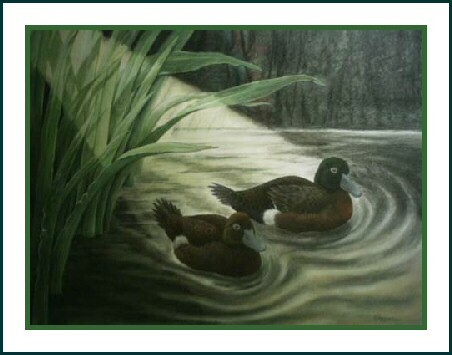 This painting has been donated to the Brown Teal Conservation Scheme. The image will be available on cards and prints and the original painting sold to raise funds for the scheme. 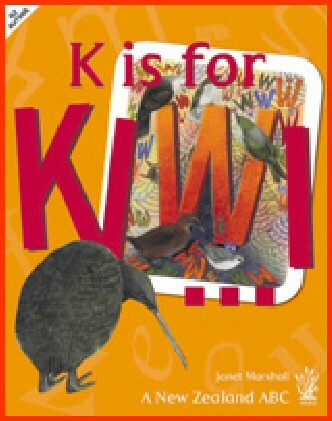 My latest book is a NZ Nature Alphabet called K is for KIWI. 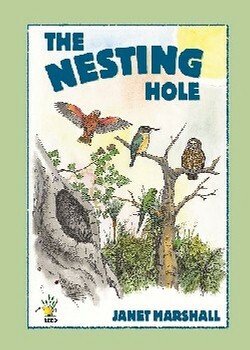 My earlier children's books published by Reed was a set of 4 books on NZ birds and their habits. 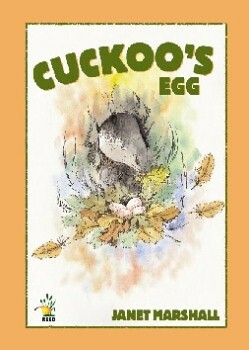 This is a delightful story for readers age 6 and up. It's Bellbird's birthday but Bellbird is nowhere to be found. 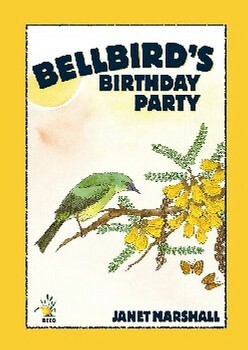 It seems that no one has remembered to invite Bellbird to his own birthday party! Janet Marshall's fresh, realistic and beautifully rendered illustrations accompany a story that will delight young and old alike. Janet Marshall brings the New Zealand bush to life in this delightful story for readers age 6 and up. Accompanied by Janet�s fresh, realistic and beautifully rendered illustrations, this is a story that will delight young and old. Someone is hiding in the swamp. Pukeko and her friends keep hearing a strange sound from the reeds by the pond, but each time they go to look they come up empty-handed. 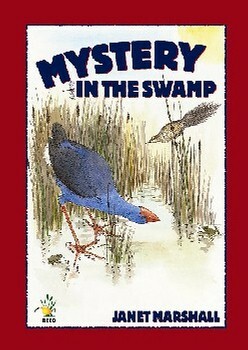 Will Pukeko and company discover who is making the strange sounds? Accompanied by Janet�s fresh, realistic and beautifully rendered illustrations, these stories will delight young and old. Janet Marshall has written a delightful story for readers age 6 and up. Find out which bird will claim the perfect nesting hole in the beech tree. Janet�s fresh, realistic and beautifully rendered illustrations ensure that these stories will delight young readers.